High-pressure cleaning of heat exchangers, cooling installations, pipes, tanks and other industrial equipments. Industrial cleaning services using vacuum trucks, high pressure pumps, etc. Management and maintenance of industrial equipment. Collecting and processing services for the disposal and recovery of the waste resulting from the industrial cleaning process. Can be executed with small interruption of the product transportation (the process is interrupted only to insert the “pig” system into the pipe). Our offered cleaning equipment is usable for pipes independent of sizes and installed location, as in refineries, power plants, petrochemical plants, different industrial domain plants, municipal heat distribution points, sewerage systems etc. The cleaning is performed by using pressurized water (up to 3000 bar or 43510 psi), adapting the necessary cleaning installation’s according to individual pipeline specification. During the operation of industrial equipment, problems caused by deposits may appear. In such a case a reduction of production capacity followed by unscheduled interruptions would be the logical consequence, which has to be avoided at all costs. Our vast experience in several successfully completed national and international maintenance operation services ensures an optimum solution for any refinery production cycle. The fast intervention of Uni-Recycling experts and the use of state-of-the-art equipment guarantees a professional approach of such an issue including a proven record of success. Unlike what happens in conventional blasting, does not requires any installation or use of scaffolding platforms for cleaning itself, neither the final cleaning of the spent sand. The platform can be useful if you require a closer visual inspection. Does not pollute the land with the extracted residue because it is aspirated directly into the tank of the truck. All corrosion protection systems are used to guarantee extended service life and thus reduced maintenance costs, environmental protection and occupational safety. The application of the coating systems can be performed by spraying, rolling or brushing. The first method mentioned is generally considered a coating system. All components, although made of concrete or steel, must be prepared according to certain guidelines. When choosing suitable surface systems, due consideration must be given to the applications and properties of the layers to be applied and the design features. The main factors in this regard are the geometry and the surface condition of the system components, pretreatment of the surfaces, material of the system component and the coating process itself. The application of the coating systems can performed by spraying, rolling or brushing. In the case of rubber coating, an elastic layer (between 2 – 6 mm), consisting of rubber (natural or synthetic), is applied to system components (steel or concrete). For this purpose, an adhesive system is applied (spraying or brushing) and then the rubber sheets are laid on the component surfaces. Coatings can be color systems or coating systems. Color systems are primarily used for the protection of plant components, parts and structures in the outdoor area against environmental influences such as: (rain, salty or acidic air). 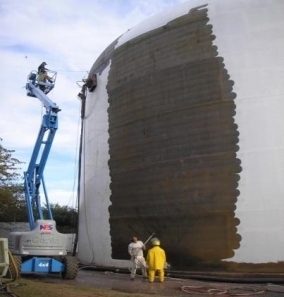 Coating systems are mainly used for protection against very aggressive media, like for containers, storage tanks, flue gas ducts, concrete surfaces or steel structures or plant components. For the protection against a wide variety of abrasive and corrosive media, rubber coating is used as a korrosion resistant liner for container, pipes, concrete components, floors and process plants. It come today rubber as linings in a thickness of 2 mm to 6 mm as a hard or soft rubber for use. With the system flushing, Uni-Recycling has developed an economical and environmentally sound alternative solution for the cleaning of heat exchangers, vessels, columns, pipes, crude oil plants and other plant components during ongoing operations and prior to shutdowns. The system flushing cleans the plant and plant components in the closed circulation under use of a biologically degradable chemical that was developed in order to absorb special oily components such as oil, gas oil, benzene, etc. Complex disassembling, transport and assembly work do not apply. The process is low in emissions because of the closeness of the system. The chemical method is used for interior cleaning of pipes, eliminating the residues and other debris. Acid cleaning – once the inner surface is in a hydrophilic state, the deposits are soaked and / or dissolved by applying acid mixtures, as established by specific technological recipes. These mixtures contain corrosion inhibitors that prevent basic metals corrosion. In this step, the acid will be gradually added to the cleaning water, while constantly monitoring the mixture’s PH. The speed of the transited solution inside the pipeline will be around 1.5 – 2 m/s. Rinsing – After the acid cleaning, rinsing with water will be needed, in order to remove the debris, sludge or acid traces. Passivation (using a inhibiting acid solution) – After the acid cleaning and rinsing steps, the metal that’s been exposed to the cleaning operations is in a very chemical active state. If left or exposed to the atmospheric conditions, its surface will quickly oxidize in a uncontrollable manner. Thus, a passivation process will be carried out, in order to enable the formation of an adherent layer and a protective film against the oxidation of the base metal. This step will be carried out in a closed circuit, after the entire air mixture from the installation has been removed through taps, valves or existing vents. In the end, a rinsing, using water (chlorine free) will be carried out, and the pipeline will be drained. If necessary, in order to remove the remaining water inside the elbows, valves, etc., the entire pipeline route will be blown using compressed air.